A line from Abraham Lincoln's "Gettysburg Address" is displayed at the Lincoln Memorial in Washington. From VOA Learning English, welcome to This is America. I'm Steve Ember. Today we tell about Abraham Lincoln, the 16th president of the United States. That was actor Henry Fonda, speaking the words of President Lincoln. This recitation is part of “A Lincoln Portrait,” a work by American composer Aaron Copland. Today, we tell the story of this great American president. Come along with us. The words we just heard were part of a speech President Lincoln gave to the United States Congress in 1862. At the time, he was leading the nation during the Civil War. This was the most serious crisis in American history. Lincoln spoke to lawmakers a month before he signed the Emancipation Proclamation. The document declared the freedom of slaves in states controlled by rebel forces. 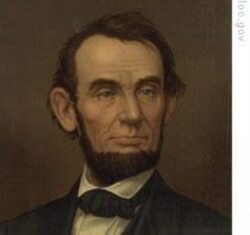 Abraham Lincoln was born in Kentucky on February 12th, 1809. He grew up in Illinois. His family was poor and had no education. Abraham Lincoln taught himself what he needed to know. He became a lawyer. 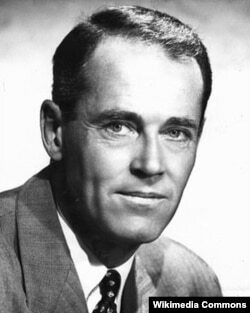 He served in the Illinois state legislature and in the United States Congress. In 1860, he was elected to the country's highest office. President Lincoln helped end slavery in the nation. And he helped keep the American union from splitting apart during the Civil War. Lincoln believed that democracy can be a lasting form of government. In 1863, the president gave what became his most famous speech. Union armies of the north had won two great victories that year. They defeated the Confederate armies of the south at Vicksburg, Mississippi and at Gettysburg, Pennsylvania. Ceremonies were held to honor the dead soldiers on the Gettysburg battlefield. Abraham Lincoln wrote some of the most memorable words in American history. 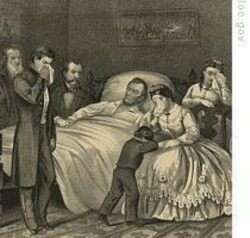 Lincoln was assassinated in 1865. He was shot at Ford’s Theater in Washington while he and his wife were watching a play. He died a few days after the Civil War ended. Yet his words live on. Aaron Copland wrote “A Lincoln Portrait” for speaker and symphony orchestra. The speaker recites words taken from Lincoln’s speeches, letters, and the Gettysburg Address. 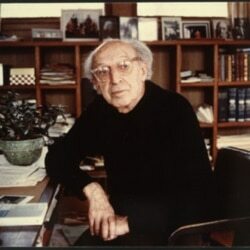 In our conversation in 1975, Copland remembered the very first speaker. “It was Carl Sandburg, the great biographer of Lincoln, so that one had full confidence that he knew what he was talking about. And, did Copland have a favorite speaker over the many years “A Lincoln Portrait” had been performed? In 1968, Copland led the London Symphony Orchestra, with Henry Fonda speaking the words of Lincoln – in just the way the composer preferred. Lincoln was a quiet man. Abe Lincoln was a quiet and a melancholy man. But, when he spoke of Democracy, this is what he said. And that’s our program honoring a great American president in his birthday month. I’m Steve Ember, inviting you to join us again next week for another This Is America program from VOA Learning English.